Installation at Islip Art Museum Carriage House, East Islip, NY. Maintaining Pleasure, 2015, wood, bent laminated plywood, industrial foam board, and paint, dimensions variable. 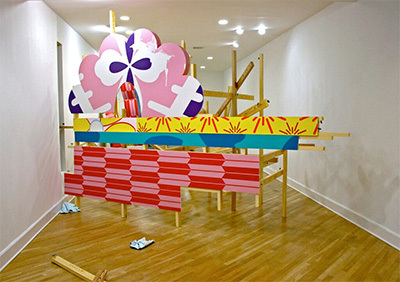 Installation at Fernando Alvarez Gallery, Stamford, CT.Structo, 2013-14, wood, bent laminated plywood, industrial foam board, and paint, dimensions variable. Courtesy of the artist. When we watch the walls of a house go up, we are aware of an implicit narrative in the skeletal studs, a uniformity that allows us to imagine a cozy life being lived inside their orderly framework. Artist Kirsten Reynolds borrows a bit of the language of that narrative and uses it to vastly different effect. She employs construction materials (plywood, insulation foam) to suggest spaces pierced by architectural arabesques and openings. Like a building under construction, her works appear in a state of flux, more question than answer. “We expect to see art from a distance,” Reynolds told me from her studio in New Hampshire. We spoke at length about her process, the evolution of her work, and about balancing her ambitious career with the needs of her two young children. She had just finished building crates for her installation to be shipped to the Alamo city. “They’re going to need a forklift,” she admits. In-process detail of the site-specific installation at Blue Star Contemporary. 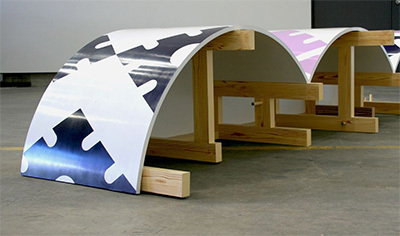 Kirsten Reynolds, Splitsplice, 2016, wood, bent laminated plywood, industrial foam board, and paint, dimensions variable. Courtesy Blue Star Contemporary. Adding to her painter’s sensibility is her prolific use of color and pattern, which is applied in various intensities from cheerful to near manic. “I was first drawn to the color yellow,” she recalls, “but too much yellow can be insidious.” Pattern was one of her nascent interests as well, especially the “candy, or toy like colors,” of Japanese papers that she encountered as a young artist working in two dimensions. From there, Reynolds began “adapting these patterns into installations,” a process that even now begins with a paper model. Blown up to the scale of an installation, these repeated motifs can be simultaneously enticing and dizzying. 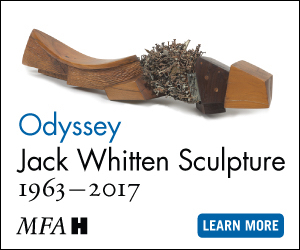 To achieve the right balance, she has been working with a scale model of Blue Star’s gallery space to conceive of Splitsplice. 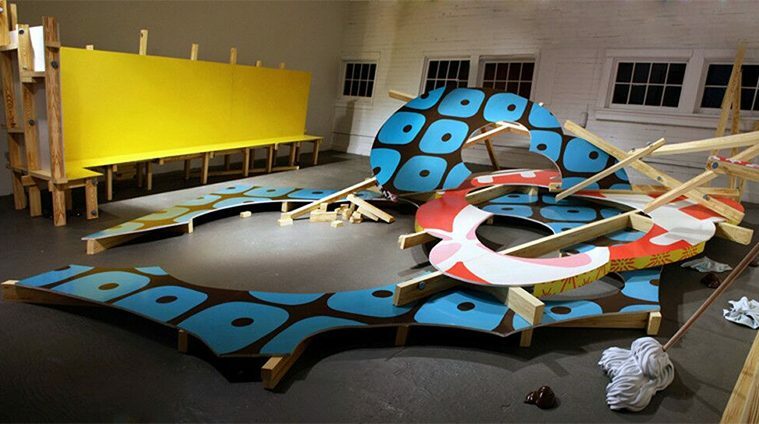 1:1 scale model for the site-specific installation at Blue Star Contemporary. 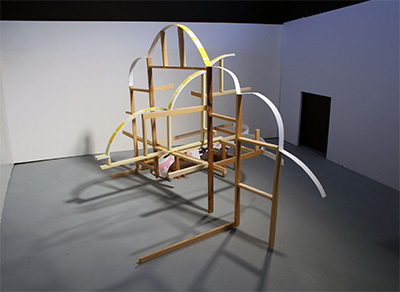 Kirsten Reynolds, Splitsplice, 2016, wood, bent laminated plywood, industrial foam board, and paint, dimensions variable. Courtesy Blue Star Contemporary.